Dropbox is essentially a cloud service that lets you store files on the internet as opposed to your own computer. You can then access the files from anywhere, including other computers, phones, and tablets. If you often need to share files between your home and your office, you may be used to carrying around a USB drive with all of your files on it or you might carry a heavy laptop around. With Dropbox, you can upload the files to your account from your house and then when you get to your place of work you can connect to Dropbox and download them. When the working day is done simply upload the files back to Dropbox and download them again when you get home. This is a much more secure method of transferring files from one place to another than carrying a device around in your pocket or briefcase. Only you can access the files in your Dropbox account unless you give permission to somebody else. Another good use of Dropbox is as a simple backup service. Imagine your house was burgled right now and the culprits stole all of your laptops, phones and other devices along with all of those precious photos and videos of your children. You would be devastated. You can always get a new computer but you can't get back lost memories. It doesn't have to be a burglary, either. Imagine there was a fire. Unless you have a fire safe in your house everything will be gone and, let's face it, how many people have those lying around. Backing up all of your personal files to Dropbox means that you will always have at least 2 copies of every important file. If Dropbox ceases to exist you still have the files on your home computer and if your home computer ceases to exist you always have the files on Dropbox. Dropbox is free to use for the first 2 gigabytes which is fine for storing photos and if you just plan to use it as a method for transferring files from one place to another. 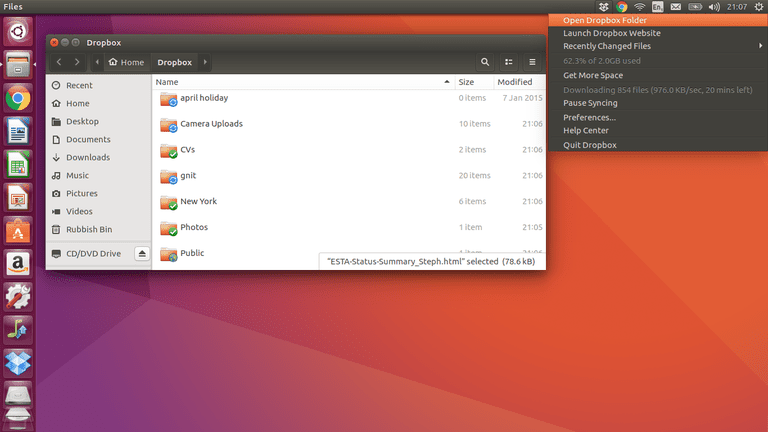 Open up the Ubuntu Software Centre by clicking the icon on the launcher, which looks like a suitcase with an A on the side. Type Dropbox into the search box. Click on the install button next to the Dropbox Integration for Nautilus, as this is the default file manager in Ubuntu. A Dropbox installation window will appear stating that the Dropbox Daemon needs to be downloaded. Dropbox will now start downloading. Dropbox will start automatically the first time but you can run it on subsequent occasions by selecting the icon from the Dash. When you first run Dropbox you will be able to either sign up for a new account or log in to an existing account. An indicator icon appears in the top right corner and when you click on the icon a list of options appears. One of the options is to open the Dropbox folder. You can now drag and drop files into that folder to upload them. When you open the Dropbox folder the files will begin to synchronize. If there are lots of files you may want to pause this process and you can do this by clicking on the menu and choosing "Pause Syncing". The general tab lets you determine whether you want Dropbox to run at startup and you can also set up notifications. The account tab lets you change the folder on your computer where Dropbox files are downloaded to. You can also choose which folders are synchronized between Dropbox and your computer. Finally, you can unlink the account you logged in as. The bandwidth tab lets you limit the download and upload rates. Finally the proxies tab lets you set up proxies if you connect to the internet via a proxy server. If for whatever reason Dropbox appears to stop working, open a terminal and type the following command to stop the service. When the installation has finished a new icon will appear in the system tray and a login box will appear. There is a sign-up link if you haven't got an account. Using Dropbox is very easy because a folder appears in your File browser (icon with the filing cabinet). Simply drag and drop files to and from that folder to upload and download them. You can use the system tray icon to launch the website, check the synchronization status (basically, when you copy a file into the folder it takes time to upload), view recently changed files and pause syncing. There is also a web interface available for Dropbox if you need one, an app for Android and an app for the iPhone. Installing Dropbox is number 23 on the list of 38 Things to Do After Installing Ubuntu.